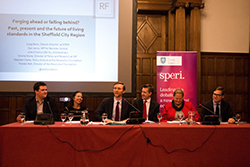 The Resolution Foundation launched “Forging ahead or falling behind: Devolution and the future of living standards in the Sheffield City Region” yesterday evening in the Sheffield Town Hall. Its report analyses economic inequalities between cities and within cities and was presented by Stephen Clarke, Research and Policy Analyst at the Resolution Foundation. He showed how the Sheffield City Region lags behind in various sectors but mostly in terms of hourly pay. 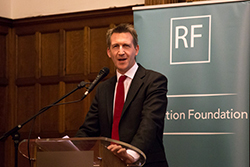 Guest discussants – Dan Jarvis, MP for Barnsley Central; Emma Stone, Director of Policy and Research at Joseph Rowntree Foundation (JRF); Julie Kenny CBE DL, Entrepreneur; and Craig Berry, Deputy Director at SPERI – offered their views on the strengths and weaknesses of the South Yorkshire economy. There was agreement around the lack of clarity on how a Metro mayor would help boost the economy given that devolution powers would still be minimal. Julie Kenny emphasised that it was down to local leaders to support businesses, and to business leaders to invest in their workforces and pay decent wages. The consensus was that the South Yorkshire economy had a lot of potential, especially with the development of the advanced manufacturing sector on the former site of Orgreave. This progress shows that, with bold and courageous investments, the future prospects of the area can be much improved. The challenge is to make sure that future growth is inclusive. The event concluded with a lively Q&A session chaired by Torsten Bell, Director of the Resolution Foundation.